With winds raging at more than 200 miles an hour, Cyclone Pam has left a path of distraction on the island nation of Vanuatu in the South Pacific. There have been 11 fatalities recorded since the category 5 storm hit, and Vanuatu’s population of 26,000, inhabiting 60 of the archipelago’s 80 islands, is in trouble as water and supplies dry up and roads are impassable. The capital of Port Vila has seen destruction to local yachts, and 90 per cent of structures on the island are said to be damaged or destroyed completely. 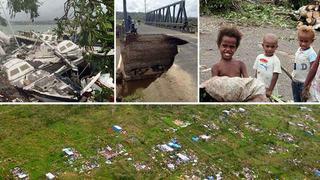 Aid agencies are reporting that outlying areas of Vanuatu that fell in Cyclone Pam’s path have suffered “significantly worse” damage than Port Vila. The BBC has reported that those living in Vanuatu’s remote northwest region are now having to drink saltwater with no freshwater available. Superyachts are being asked to bring aid and support the cyclone-stricken island nation. Non-profit disaster relief charity YachtAid Global reports that the first superyacht is on the way already. While this might seem the most obvious and usual way to help, what’s not typical is that YachtAid Global is pledging it will match monetary donations up to the first US$5,000, giving extra motivation to whip out that cheque book and make a charitable donation. As many locals survive on subsistence farming, growing their own food, they are going hungry because crops have been destroyed and there are no stores on many of the islands. Disaster relief – from food to medical supplies – can be delivered by yachts cruising in regions nearby the afflicted Vanuatu. Any yachts in the area can contact YachtAid Global, which is coordinating the delivery of supplies to the stricken areas. One of the biggest dangers is the lack of water, with reports that locals have had to resort to drinking dangerous seawater. A unique way that superyachts can help is to use their reverse osmosis water maker systems to provide freshwater to the islands, bringing life-saving relief. Beyond delivering supplies, superyachts can also help by bringing doctors and aid workers. Y.CO has reported that the yacht it manages, 73m Dragonfly, is doing just that by transporting medical teams and aid from the island nation’s capital to more remote areas. Dragonfly arrived in Vanuatu early in the day on 21 March, after completing a 1,600 nautical mile, three-day journey. Working with Vanuatu's government, Dragonfly will be supplying aid and will also provide medical response to the Shepherd Islands, which are northeast of Efate, home to the capital of Port Vila. Dragonfly's captain Mike George says, “Dragonfly has extensively cruised the beautiful and remote areas of Vanuatu over the past two years. We were shocked and saddened to see the devastation caused by Cyclone Pam, and we know that the resources we have onboard can make a huge difference and will ultimately save lives." For yachts and other concerned parties located in New Zealand, YachtAid Global has also set up drop-off points Auckland where clothes and other goods can be donated, and the supplies will then be delivered to Vanuatu.